Flower Design adds important accents to rooms. For only compositions with flowers complete every interior. They underline the impact of architecture and interior design, and at the same time initiate a dialogue between the indoors and the outdoors. The result is a vivid design language. 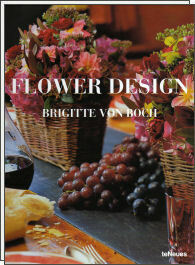 Brigitte von Boch understands the art of flower arrangements, and her Flower Designs carry her own trademark. She appreciates familiar combinations, but also loves to play with opposites. Such tensions liven up her art. "One only needs to behold the flora, respect the species' uniqueness, and accept their natural essences. Not to subdue, but discover them. Not to distort them. Not force them into Sunday clothes. Only bring them to life." I would define my own style in the same way Christian Tortu, the famous Parisian flowerartist, describes his philosophy. Because in flower art it is primarily essential to grasp the plants' character, so their special magic can spine. With my Flower Design I intend to show how the multifaceted approaches to this taks. After all, only harmony and contrasts can breathe life into arrangements. This is dependent on various components: the composition of the different flowers, the form, the colour gradient, the texture and material of the vessels in which they are arranged, as well as the interior, the stage, so to speak, upon which they are placed. And finally, it depends on the hint of humour, the slight kick, the play with the unexpected. I love the natural harmony, which can be experienced outdoors. But I also like unexpected encounters: daisy meets lemon thyme, Easter egg meets carnation, hydrangea meets raspberry. I like the dynamism of a delicate blossom, protected by a robust foliage, transparency juxtaposed to luscious green, and thorniness to softness. The result is always a still life, which is made fro eternity.